If Pittsburgh is not on your list of races to run, it should be. My hometown is a little more than an hour away from Pittsburgh. As a kid, I remember driving to Pittsburgh and there was that moment of awe when the car emerged from the Fort Pitt Tunnel and you found yourself faced with the impressive skyline and gorgeous rivers ringed by the imposing mountains – OK, now that I have seen the Rockies, the Alleghenies are no longer imposing, but to a kid from Ohio, they certainly seemed to be. A few years ago I happened to find myself along the river for the city’s 250th birthday celebration, which to this day is the most impressive fireworks display I have ever seen live. From where we stood it seemed as though they were determined to cover every building, bridge, and barge with pyrotechnics. So I have always had a certain affinity for the downtown and three rivers area. When I learned that there was a half marathon based in downtown, that crossed all three rivers and was relatively flat, I knew I had to run that race. (Two out of three ain’t bad, but more on that later). 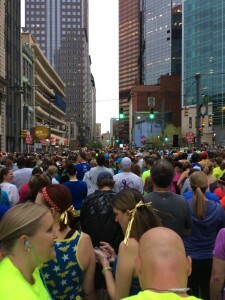 Like many other races, Pittsburgh has been selling out earlier and earlier every year. Last year the half marathon sold out in February, so I was determined to register early and not get shut out. I had no problem registering in January, but long before race day the event had indeed sold out. I tried convincing friends to run with me, but alas I could not convince anyone to join in the fun. No matter, I would try my first completely solo half marathon, or so I thought. My Casual Running adventures have given me many memorable and unplanned experiences. This race would provide another. Unexpected Magic. 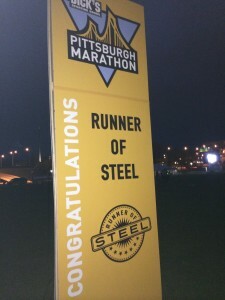 Unexpectedly, two days before the race, I found out via a random check of Facebook that Karen, a good friend of mine from college, would be in Pittsburgh for a conference that same weekend. I messaged her to say that I would be in town for the race. That is when I learned that she too would be running the half marathon. Just like that, I had an instant running buddy. Karen and I have kept in touch over the years, but we had not seen each other in a while. Had it not been for a random message on Facebook, we would have run the same race and not known until after. But Casual Running brought us together, and it was great to catch up. I decided to throw caution to the wind on this race. I had a lot going on in the week leading up to the race, so rather than staying in Pittsburgh the night before the race, I decided to stay at home and sleep in my own bed. A colleague of mine who was also running the half marathon generously offered to pick up my bib and packet so I did not have to drive to the city twice. So this became the first half marathon that I slept in my own bed the night before. Because my wake-up call would be that much earlier, the day before the race I only allowed myself one cup of coffee in the morning, and then it was only water the rest of the day. This plan worked as I was able to be in bed by 8:00 pm and asleep before 9:00 pm. Even with a 3:45 am wake-up call, I still managed more than 7 and a half hours of sleep – far and away the best pre-race night’s sleep I’ve ever managed. Maybe there is something to sleeping in your own bed after all. As I said, I did not go to this year’s expo as a colleague of mine picked up my packet for me, but I did attend the 2013 expo and spoke with my friend and my colleague about it and learned that not much changed from the 2013 edition. So here are my thoughts given my admittedly-limited knowledge base. The fact that Pittsburgh still allows you to pick up race packets for friends is a good thing. While I make a point to go to expos whenever I can, this was one of those circumstances where it was helpful to me to have someone pick my packet up for me. It saved me a lot in terms of time and money (an extra roundtrip of gas, tolls, etc.). The process for doing so was straight-forward. I downloaded a form from the event’s website and gave my colleague a copy of my ID, and she was able to get everything with no fuss or muss. From what I was told, the 2014 packet pickup process was smooth and efficient. The volunteers were on the ball, everything was well-organized and they had runners quickly on their way. This may sound like a “little thing,” but seeing as it is the main purpose of the expo, it is important to get it right, and Pittsburgh did. The expo is located in downtown in the David L. Lawrence Convention Center. If you have never been, it is a cool, sleek, modern building located right on the riverfront. You cannot beat the location, and parking was surprisingly easy to come by (in both 2013 and 2014). The biggest concern is that, while there is a nice selection of vendors, there does not seem to be much rhyme or reason to the expo layout. This may be the result of trying to “fit” the expo into the available space, but it was difficult to locate specific vendor and promotional booths. The layout also made the expo feel more crowded than it really was. During the 2013 expo I accidently bumped into Jeff Galloway (oops!) while he was speaking with some runners. It was that tight. I have since met Jeff Galloway on several occasions, and can attest that he really is the nicest guy. After leaving the expo, a stroll along the riverfront is a mere left turn out of the door. In terms of urban geography, if there a better expo location, I have yet to find one. Pittsburgh is a solid performer in the swag department. 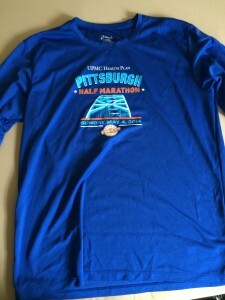 This year half marathon runners received a nice quality Asics brand long-sleeved tech shirt, in a very nice shade of blue. 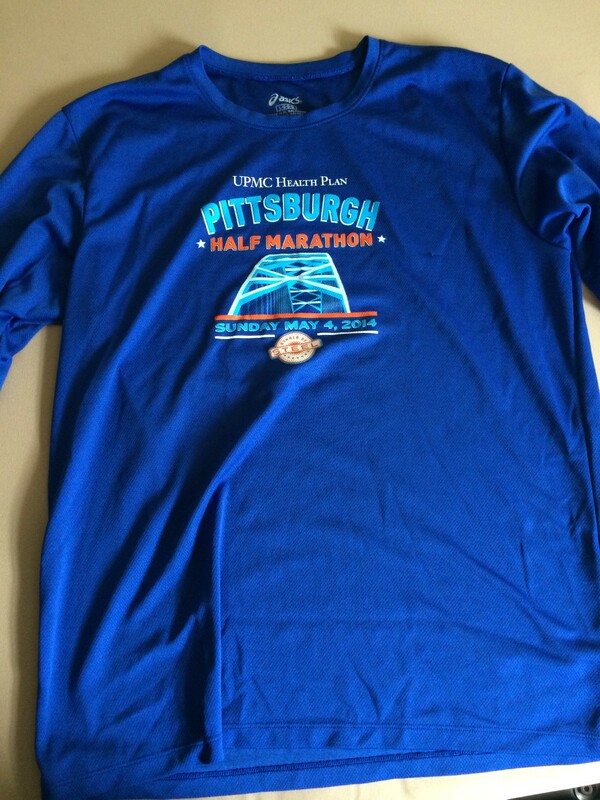 Adhering to the “getting only a shirt is not enough for what you paid for this race” school of thought, Pittsburgh also gives runners a nice nylon drawstring bag. It is a nice quality bag that sports the race logo and a second zippered pouch. Let this be a lesson to race directors, a little extra swag goes a long way. In 2014, we suffered through a winter marked by the polar vortex and then a cold and very wet spring. In Northeast Ohio/Western Pennsylvania, it rained nearly every day leading up to the race, and the race day forecast changed seemingly every day. If you did not like the race day forecast, just wait 5 minutes and re-load your weather app, it was sure to change. The day before the race my app told me to expect temps in the high 50’s with less than a 50% chance of rain. I settled on a tech tank top, compression shorts, mid length running shorts, and my Mizuno Wave Evo running shoes. I made sure to pack a light water resistant shell in case it rained, and naturally, I forgot it in the car. For tech, I prepared my standard IPhone. I somehow misplaced my headphones, so I ran to Target the night before the race and bought a new pair of Yurbud Ironman headphones. I was in luck, as I grabbed the last pair they had in stock. As I said earlier, because of some scheduling quirks that week, I decided to stay at home in my own bed. My alarm went off at 3:45 am and I learned how nice it was to get ready for a race at home as I had everything laid out and prepped the night before. As I was loading my car, I somehow managed to snag my running shorts on my car door, ripping them at the seam. I ran back in the house and scrambled to find a replacement pair. This is definitely not what you want to be doing at 4:30 in the morning on race day. But I swapped out my shorts and was soon on my way. The drive into downtown only took me a little over an hour as there was no traffic to speak of, and I was rewarded with my favorite view of the skyline as I emerged from behind the mountains. It really is gorgeous. Parking at the sports complex across the river was abundant ($5 charge) and easy. The best part about this was that they had port-a-potties right at the parking lots. 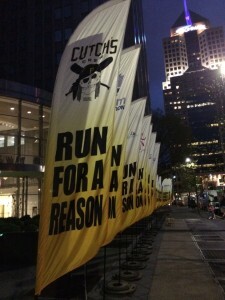 I do not know if these were put there by race organizers or the Pittsburgh Pirates, who had a game later that day, but they were a welcome surprise. Observational warning: We have all been on remote running trails and witnessed runners putting keys on their tires so they do not have to carry them while they run. I saw a runner do this with her luxury SUV. The problem is that the clearance of the wheel well was so high and her keys were so big, that the keys were clearly visible on the tire. Now, this is a downtown area where people know that cars will be left alone for hours. I would highly recommend NOT doing this. Race organizers do provide bag checks for a reason, please be smart and use them. I chose to park at the sports complex across the river because it is close to the start line, inside of the half marathon course, but outside of the second half of the marathon course. As I planned on leaving immediately after my race, I knew the roads around the lots would be open when I was done, so this worked out nicely. From the parking lots it is a nice, easy stroll across the river by a nearby bridge into Point State Park. It was easy to find the way, just follow the parade of runners. 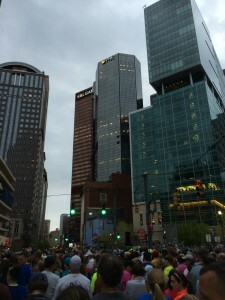 The Pittsburgh race organizers put on a nice show. As soon as I arrived in the event “bubble” there were banners everywhere, and good branding is a sign of a good event. They also had ample port-a-potties in the pre-race area (I have never seen such short lines at a big race) and ample bag check stations. If there is one concern I had, it is that I had trouble meeting up with my friends because, when they asked for directions from volunteers (and even a police officer), those volunteers (and even the police officer) were not familiar with the pre-race area and could not provide helpful directions to our appointed meeting area. I did eventually meet up with my friends and got to spend some time catching up with them, however, because of the delay we were not able to load into our designated corral (Corral C) and had to move into the last corral (D). This meant waiting around longer for the start and not having a good view of the pre-race festivities. It tried to rain on us while we stood there, but other than that, the weather was pretty ideal. TMI Alert. As we had to stand around longer than anticipated before the start, by the time we made our way up to the starting line, I really had to go to the bathroom. This is a problem I frequently have – because I sweat a lot while running, I intentionally over-hydrate before a race and I have not quite figured out the best schedule for this. Fortunately, race organizers had port-a-potties inside the area for each corral, so I said goodbye to my friend (who planned on running faster than me) and went to visit the bathroom. This was great because it would not count against my chip time. After that, I was quickly back on my way. Don’t miss the conclusion of this race review: Read Part 2 now.